The only problem here is that the sort of industry experts she seeks out are people like Michael Hoynes, who recommend diversifying product lines, targeting the store to families, and other marketing nonsense that has nothing to do with books or how to reach people who care about books and are willing to spend money on them. I obviously love the store quite a bit. I still buy most of my books there—about 100 a year. I claim at least some responsibility for the store’s revival, and yet I also understand that in order to reshape itself to survive, Kepler’s may, in fact, alienate me. I sure hope they don’t, that they beef up their literary fiction section, stop cutting back on periodicals, and find some way to finance doing so. If that means selling ridiculous games and diaries and DVDs and Christmas cards, then so be it. But I think they still need to figure out a) How are we going to make money? and b) What are we going to invest that money in? What is going to give us the greatest return? And what is going to be of long-term, literary value to our customers? This is a decision that you can only make with strong leadership and leaders who are interested in books and business. When I used to travel more and visit new bookstores on a regular basis, I had two tests for whether the store was good or not: 1. Did they stock all books by F. Scott Fitzgerald? (He died at 44, after all, and only has about a dozen books.) and 2. Do they have The Recognitions by William Gaddis. Fail both, and you’re out of the running. Those tests have not changed in years, and I don’t expect them to. On a final note, the article mentions setting trackable benchmarks for the staff, which I completely agree with, but the question is this: Can a metrics-driven business model be compatible with an art form that is not. Seriously, if the literary business was entirely driven by sales, we would have only be able to choose a bunch of crappy best-selling novels by John Grisham, Michael Crichton, et al. As Banta had come to realize, Kepler would have to learn an entirely different management style if the company were to be turned around and set up to last for another 50 years–the goal set by Méndez and the board. He would have to put managers in place, give them real responsibilities, and hold them accountable. He would have to commit to a plan with realistic projections, quantified goals, and specific benchmarks. Banta and her colleagues had already identified the key areas to concentrate on. They were the six imperatives that made up her “bubbles of focus.” The first bubble was the core: doing the things that defined Kepler’s mission of being the local area’s community and cultural destination. The second: sell more effectively to current customers. The third: expand and diversify the customer base. The fourth: expand and diversify the store’s product line. The fifth: develop an employee culture of empowerment with total customer focus and an understanding of person-to-person marketing. The sixth: reduce costs and improve efficiencies. Banta wanted the participants in the meetings to lay out all the ideas they had for addressing the imperatives. She then wanted them to decide on the three to five most promising ones in each area, estimate the costs and returns, assign responsibility, and settle on the measurements they would use to monitor progress. While I was living in New York four years ago, I ran into a former Kepler’s employee, who recounted Clark Kepler’s ridiculous rules for his employees, which included not being allowed to sit down or read while on the job. Burlingham seems to suggest that these rules were actually legitimate. As a manager, he was a one-man band. Every significant problem came to him. He wasn’t even willing to delegate responsibility for checking the suggestion box. On top of that, he had an elaborate set of written rules governing everything an employee might do. Aside from contributing nothing to the business, the rules sent exactly the wrong message to the staff: You are not empowered to think for yourself. Their point about how cell phones prevent you from being able to be alone, to seek real solitude, combined with the barrier they provide to real connection is dead on. How many times have you been hanging out with someone when their cell phone rings or they decide they have to call someone? It doesn’t even have to happen, but the idea that it can, that it could, prevents us from ever fully being able to focus on individuals for any length of time in our daily lives. For some reason, I feel like Jonathan Franzen once used the phrase “fraternity of solitude,” but no matter. I’ve been reading n+1 ever since it debuted, and it may now, after its previous issue’s survey of American writing and the 10 pages I’ve read of the new issue, be my favorite magazine. Period. He insists that we must face our mortality, that from our finitude comes whatever wisdom we have. His poems strive to remind of of our earliest experiences of solitude, those moments of wordless feelings that shaped our identities. We must return again to that moment when we found ourselves for the first time in the presence of that most ineffable of realities. Poetry for Bonnefoy is a story of one subject, one great emotion. Not much else happens in his poems. There are no cities, no history, and almost no other people. He is a poet of small ephiphanies: some long-ago summer evening when the night forgot to fall while a lone child played on the road and a distance voice kept calling him. This is the secret of his lyricism, the memory of a fragment of time touched by eternity that he cannot let go. Is this one obsession enough for a lifetime of poetry? In a few of his finest poems, Bonnefoy makes us believe that it is. 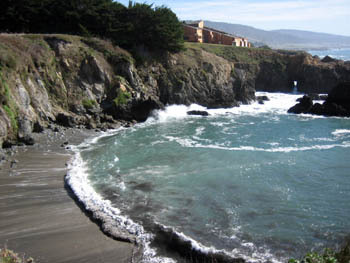 When I was in high school, one of my best friends would occasionally tell me that his parents were spending the weekend at Sea Ranch. I imagined a bunch of cows living by the ocean, and he explained, “No, no cows. There’s, like, golf and stuff.” I would respond, “Cows! Moo!” It turns out that there are indeed cows. 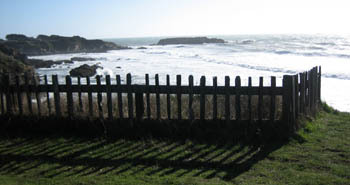 Sea ranch is a community of vacation homes along the coast about 120 miles north of San Francisco. I finally went there over the long Presidents Day weekend, and did not want to leave yesterday. While there, I read an excellent article in the New Yorker about the HP “pretexting” scandal by James Stewart along with a slightly less interesting article about the ramifications of Ruth Lilly’s $200 million gift to the Poetry Foundation. In it, Dana Goodyear portrays opposition to the commercial view of poetry expressed by the foundation’s head, John Barr, whom she quotes, “If you look at drama in Shakespeare’s day, or the novel in the last century, or the movie today, it suggests that an art enters its golden age when it is addressed to and energized by the general audiences of its time.” He seems to be dead on, if he wants to doom poetry to irrelevance. The problem with his view is that art that considers its audience, art that treats its audience like consumers to be pleased and entertained is exactly the sort of art that becomes stagnant, which is, apparently, Barr’s greatest fear. What emerges from a reading of “Twenty-Eight Artists and Two Saints” is Acocella’s — and through hers our own — respect and in certain cases even reverence for the dogged faith on which an artistic career is built. We know the seductive alchemy of art. To transform private anguish into a narrative of truth if not beauty; to make sense where there was none; to bring order out of chaos: these are the promises art makes. Fulfilling them requires something else entirely, an attribute closer to blindness than to inspiration — the refusal to give up when the odds predict defeat, again. “The relation between morality and imagination may be a complicated one, but it does exist,” she writes, analyzing the narrowness of Dorothy Parker’s vision, a function, she believes, of her selfishness. “Hope, forgiveness — these are not just moral actions. They are enlargements of the mind. Without them, you remain in the tunnel of the self.” Like Sontag, like every great critic, Acocella is subjective, uncompromising. She has a distinct point of view, a refreshingly not-fashionable one — she salutes Sunday-school virtues! — and writes from her conviction that beneath its hectic, irresponsible, even intoxicated surface, art makes singularly unglamorous demands: integrity, sacrifice, discipline. Hers is a vision that allows art its mystery but not its pretensions, to which she is acutely sensitive. What better instincts could a critic have? Before Green Apple, I stopped at the Sausalito Taco Shop, which deserves every one of its five-star ratings on Yelp. 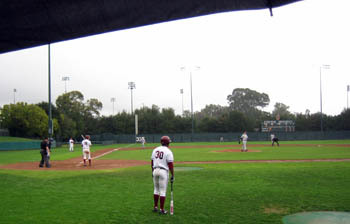 Before going up to San Francisco today, I watched three innings of the Stanford vs. Fresno state game in the rain. I’ve only missed three Stanford home openers in this decade, and I wasn’t about to miss this one after having stayed home on Friday night when the game was rained out. A nation’s possessiveness toward its artists works as a small-context terrorism, reducing the whole meaning of a work to the role it plays in its homeland. Every novel created with real passion aspires quite naturally to a lasting aesthetic value, meaning to a value capable of surviving its author. To write without having that ambition is cynicism: a mediocre plumber may be useful to people, but a mediocre novelist who consciously produces books that are ephemeral, commonplace, conventional–thus not useful, thus burdensome, thus noxious–is contemptible. Steve Jobs posted his “Thoughts on Music” on Apple’s website, calling for the music industry to end its insistence on DRM. As many have noted, the statement is aptly timed to address growing pressure on Apple to open the iTunes music store to other digital music players. I’ve never quite understood what the music industry is so scared of, anyway. Though I love my iPod, I’ve only bought 2 songs from iTunes because I couldn’t find them on CDs elsewhere. I still fail to understand why so many people are willing to pay for such inferior copies of songs. Seriously, play an AAC file from iTunes and a real CD; you’ll hear the difference. I pre-ordered Winning Eleven Pro Evolution Soccer for Xbox 360 last month from Amazon, and expected it to ship yesterday. However, today I received an email from Amazon stating that the game wouldn’t ship until next week. In my disappointment, I cancelled my order and went out to GameStop to buy a copy of the game. Like many others have said, the game looks like an HD PS2 game, but the classic Winning Eleven gameplay is still there. I’m really looking forward to EA’s UEFA Champions League 2007 game, which is coming out next month. The videos of this game look amazing. In another disappointing note, being a huge college baseball fan, I was really looking forward to the new EA NCAA baseball game, which also came out today. Unfortunately, the game is only for PS2 and the rosters aren’t even accurate, which makes no sense. EA uses accurate rosters with fake names for their NCAA football and basketball games. Why couldn’t they do the same for their baseball game?